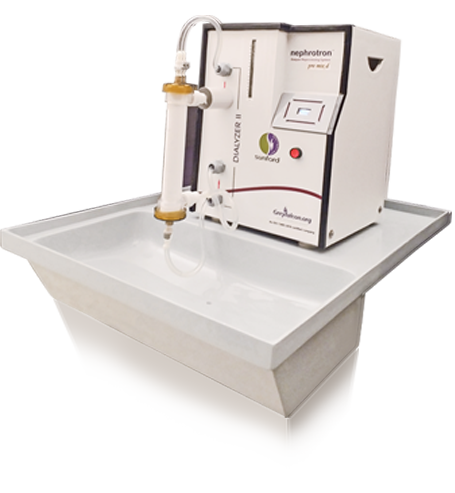 Ultra low cost, ultra compact, easy to operate, single station Dialyzer Reprocessing System. One button operation - With just one button press, it takes less than seven minutes to reprocess one dialyzer. Both high flux and low flux dialyzers and hemodia-filters can be reprocessed. In built Conductivity sensor - As the chemical is prepared manually, the machine ensures the chemical has the required conductivity. The machine stops and reports with an alarm to user if the chemical isn't premixed as per the required standards. Dialyzer membrane integrity tests - Bundle volume is visible on the level scale for manual read. The Pressure leak test is reported on the OLED display. NOTE : Disinfectant should be premixed externally, the chemical will be sucked from the can at required pressure and flow.